OSAGE CITY—The Osage City Parent-Teacher Organization’s effort to create a fun, family-friendly event was a slamming success. 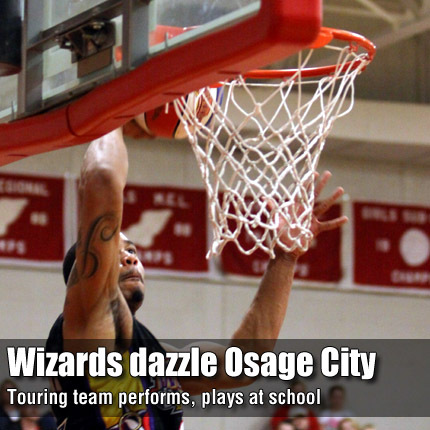 Members of the Harlem Wizards visited Osage City and Lyndon schools March 31. At that event, they played against the Osage City Celebrity Indians, made up of USD 420 staff, which drew around 500 attendees. The Wizards performed basketball tricks, skills and stunts during the school assemblies. Members ramped up antics for the main event, led by former Harlem Globetrotter Dwayne “Swoop” Simpson, who heckled fans, opposing players and even himself in a sequence of melodramatic performances. McCoy and Dunbar began talk of bringing in the Wizards at the beginning of the school year, booking the team last November. “We wanted to bring a fun, different program the community,” McCoy said. In addition to the entertainment success, the night was a success for the PTA’s budget as well. “We made some money that we’ll be able to turn around and go back to the school,” Dunbar said. PTA funds help sponsor assemblies, items for the classroom, as well as family and student-oriented community events. This weekend, the PTA plans to host a free movie night outdoors at the Santa Fe Depot in Osage City in conjunction with this weekend’s events (see related story). Additional outdoor movies are planned for the end of the school year and during the Osage City Osage County fair this summer. The PTA looks to work with the community to continue bringing entertaining and educational events to the area.